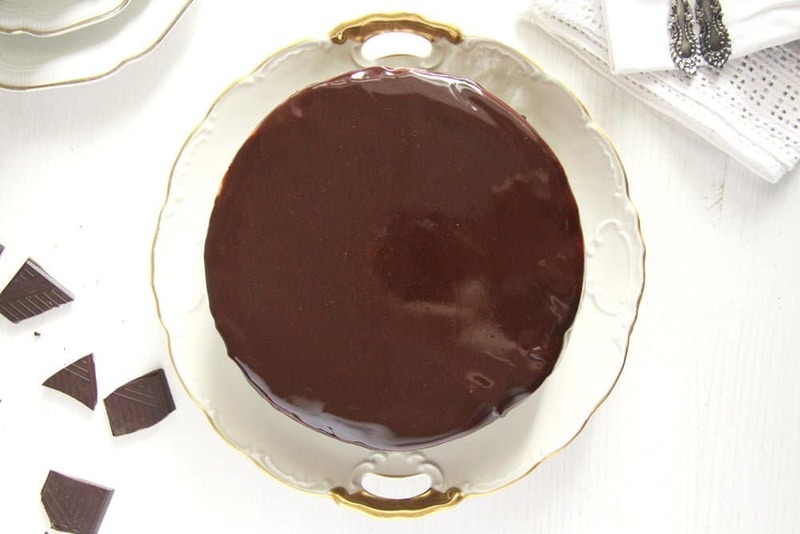 Mirror glaze chocolate zucchini cake, the sweetest way of enjoying your zucchini this summer. A nice chocolate-zucchini cake is a “must” for me every summer. 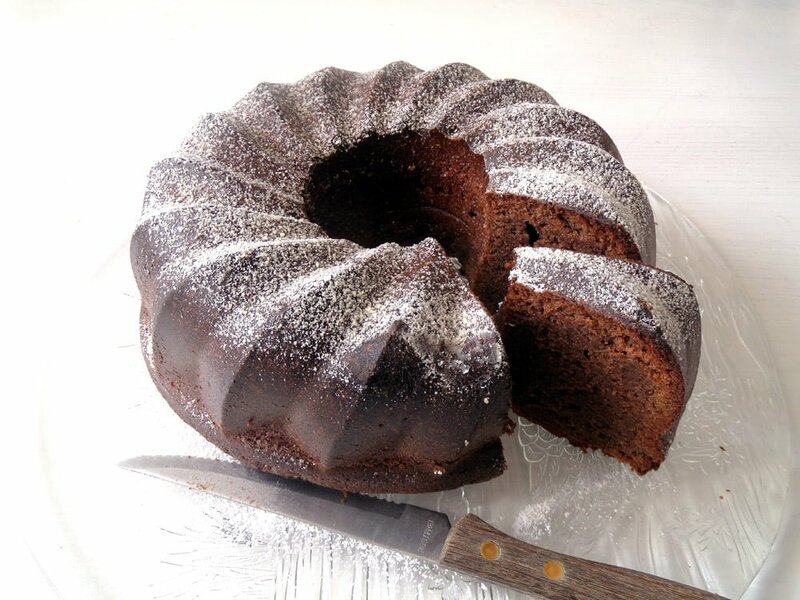 I don’t often bake chocolate cakes, but every summer, when the zucchini keep coming and coming, I can’t resist putting some of them in a chocolate cake. It just has to be! So, the same this year. I saw this recipe on a German blog Seelen Schmeichelei and I knew I had to bake that cake immediately, it looked too good to be allowed! I rarely ever crave anything made with chocolate, but those pictures really made me drool. So I cut a piece of one rather large zucchini I had, searched the cupboard for some long forgotten dark chocolate and made the cake. And because the cake was so easily and quickly made and I was in such a mood of baking, I took the recipe a step further by making a mirror glaze to pour over the cake. 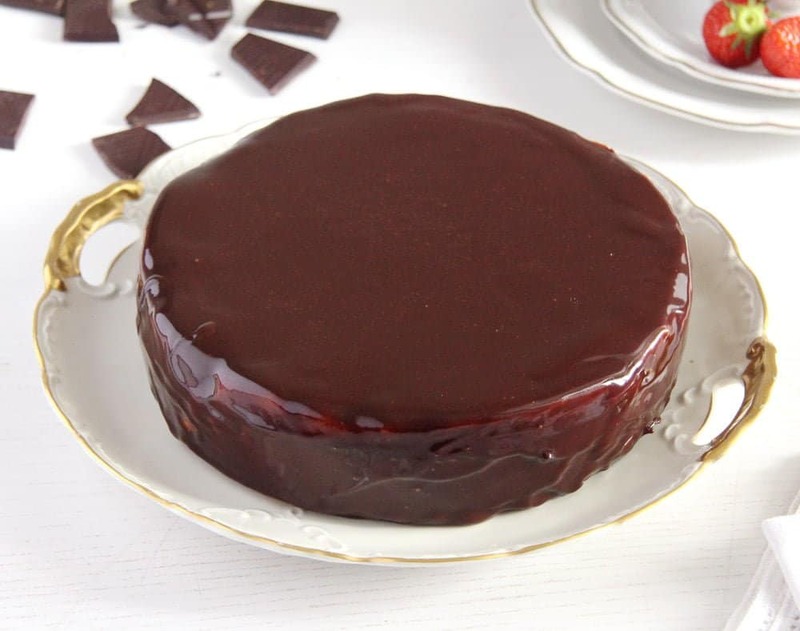 I don’t know if you have already stumbled upon this mirror-glazed cakes on Pinterest. I discovered them not long ago and just love the way they look. 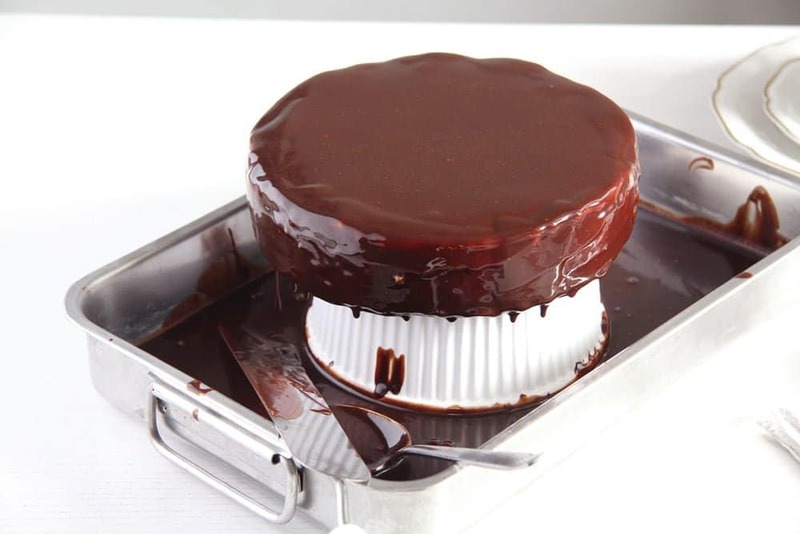 I decided to start small and try just a chocolate mirror glaze at first, but I would definitely love to try glazing some of my cakes with those wonderfully colorful glazes one can see on Pinterest! Check out my board “Simple Cakes”, if you want to see what I mean. To make the glaze I followed the instructions given in this video on You Tube. I will try to describe the procedure as detailed as possible (the glaze is easier to make than one would think), but you can watch the video if you like. I don’t have a food thermometer, so I could not be sure when the mixture reached 60 degrees Celsius and then again when the glaze reached the 29 degrees, that seems to be the perfect temperature for pouring. It still worked. I just stirred in the gelatin in the chocolate mixture like I would normally do. And when it came to pouring I think I could have waited a few minutes more, but still it worked. After the first pouring, the glaze didn’t really stay put on the sides of the cake. So I waited a few more minutes and then did the sides again. It looked just great in the end. However, if you have a thermometer, do use it, it would probably spare you 5 minutes of extra work and worries whether the glaze will work or not. Otherwise, I hope the summer is treating you well, we finally have a really nice summer day today. Take care and enjoy the rest of your weekend! Preheat the convection oven to 175 degrees Celsius/ 350 degrees Fahrenheit. Butter the bottom of a 20 cm/ 8 inch springform and line it with baking paper. 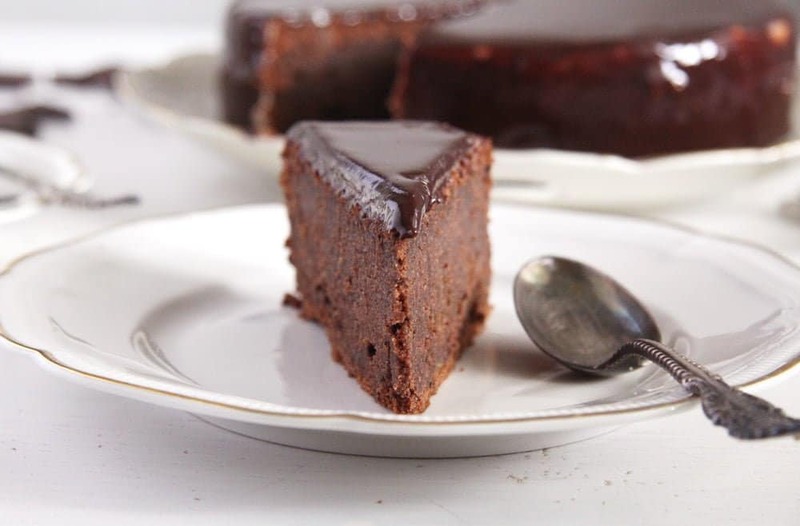 Finely grate the dark chocolate and the zucchini. Mix together the flour, cocoa powder, baking powder and salt and set aside. Cream the butter and the sugar for about 5 minutes. Add the eggs, one at a time, mixing well in between. Add the flour mixture, the milk and the rum by turns, in 2 or 3 batches. 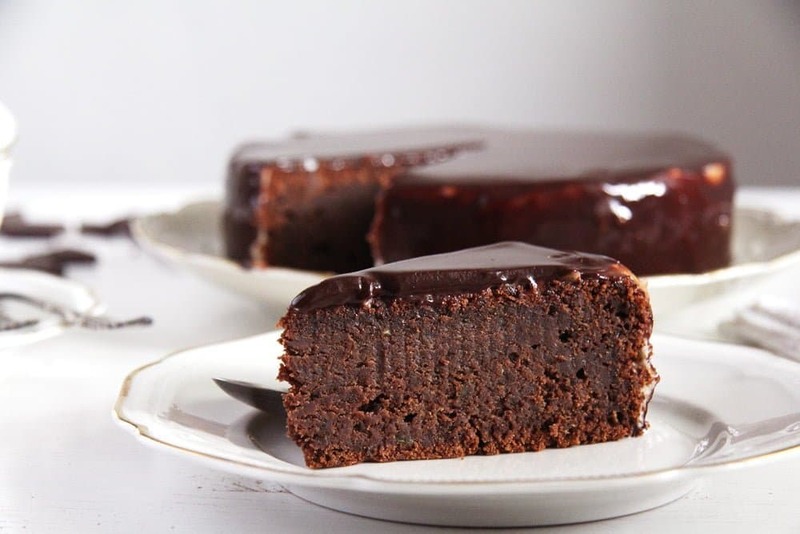 Fold in the chocolate and zucchini. Pour the mixture into the prepared springform and bake for about 1 hour. Check if the cake is done by inserting a toothpick in the middle. Leave the cake to get cold, then chill it. To make the mirror glaze, start by soaking the gelatin leaves in cold water for about 10 minutes or according to the packet's instructions. Pour the water into a small saucepan. Let it come to a boil and add the sugar. Stir well, remove from heat and add the chopped couverture chocolate. Mix with a hand whisk, add the sifted cocoa powder, mix well and add the heavy cream. Mix again and when the temperature reaches 60 degrees Celsius/ 140 degrees Fahrenheit stir in the squeezed gelatin leaves and mix until dissolved. Sieve this mixture into a jug and blend with a hand blender. Sieve again into another jug and let cool until the mixture reaches 29 degrees Celsius/ 84 degrees Fahrenheit. Place a small casserole form that is a bit smaller than the cake in a large roasting tin. Place the chilled cake on top of the small form and start pouring the glaze over it. 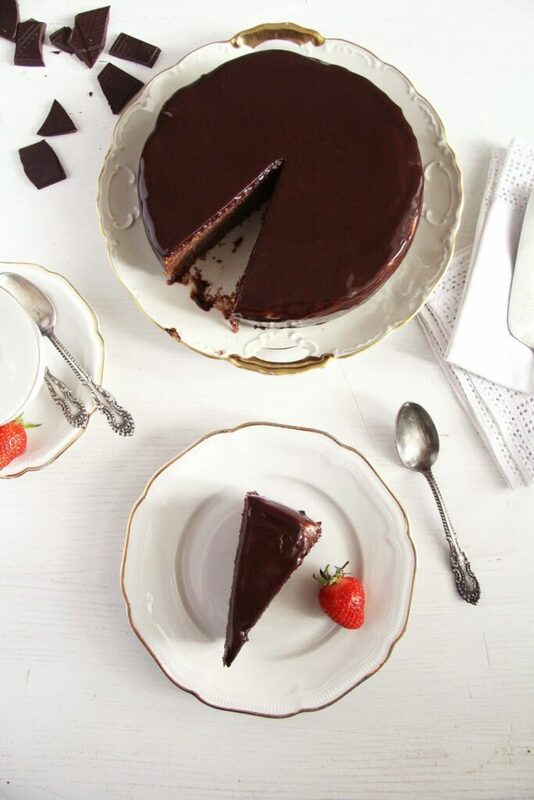 Remove excess glaze from under the cake with a knife. Refrigerate the cake until serving or decorating. I love the perfectly moist and dense texture of this zucchini cake…not sure I would add the glaze if I made one, but it surely makes the cake richer and more beautiful. What a spectacular cake! And the glaze gives it a beautiful finish. It looks amazing!! I never had zucchini cake before, because my husband is not a fan of the idea. 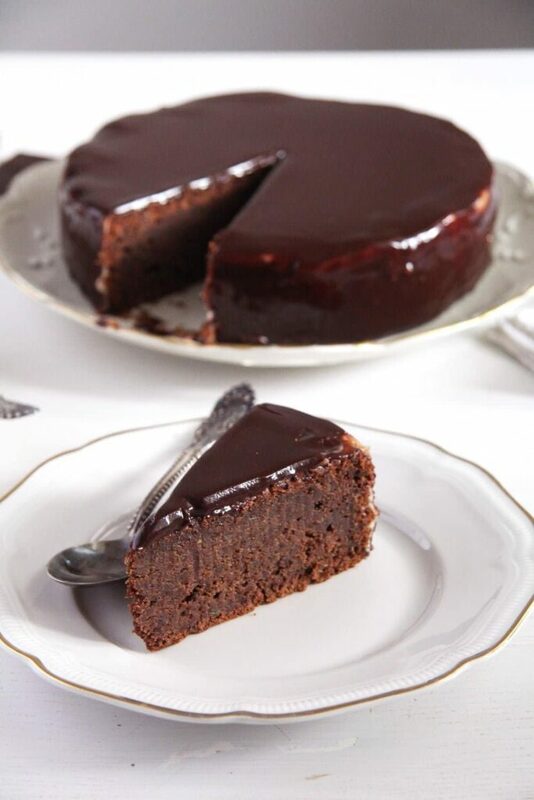 chocolate zucchini cakes are pretty special anyway, but you’ve gone above and beyond with that mirror glaze! yum! Another courgette recipe! And so tempting…. I love the moisture the courgettes seem to create.